The express cage mb326sp-b brings to you our highly consumer-friendly enclosure made for anyone that requires high storage density. 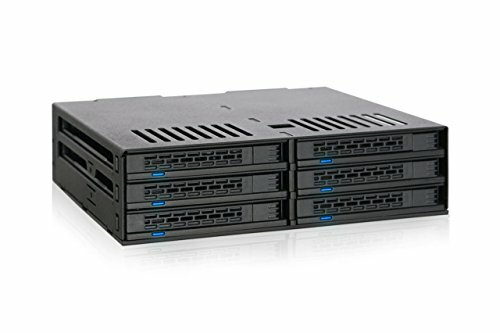 The mb326sp-b fits up to 6 x 2.5" SATA/SAS HDD/SSD (5mm - 9.5mm) into a single external 5.25" bay with the ability to hot swap for easy drive replacement. The express cage name reflects the tool-less drive installation design that makes installing your drive just as simple as a tray-less device, and optional bottom tray screw holes are provided for extra protection and added stability. With dual 40mm cooling fans placed behind the unit and all around ventilation, your drives will stay cooler than the arctic. The fan speed slider switch lets you choose between high, low, or auto smart cooling, so you can set it based on your preference. If you have any questions about this product by ICY DOCK, contact us by completing and submitting the form below. If you are looking for a specif part number, please include it with your message.